What could be more festive than an extravagance of precious metals. Take your pick of silver or gold— or both — and mix them with a single bright color or a profusion of jewel tones. Just be sure not to skimp on the glitter and shine, whether you choose to go dark and moody or light and bright! Take a look at two of our favorite New Years looks! 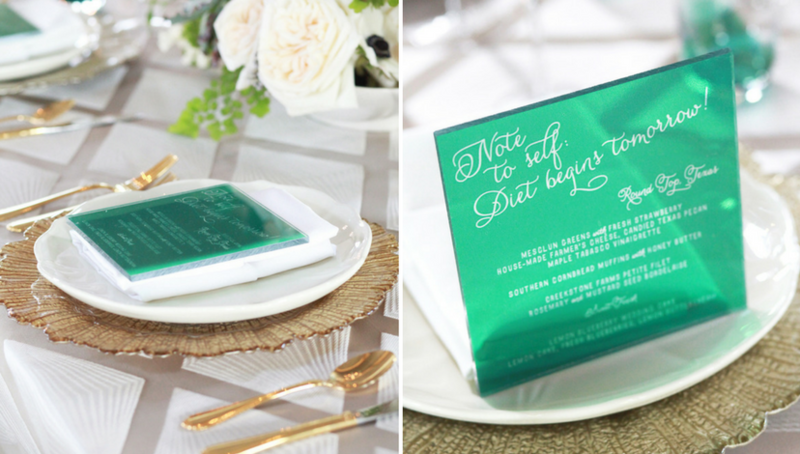 Bright emerald accents are the jewels in the crown for this elegant party setting that is as light as a feather, but nothing if not unique and energetic. 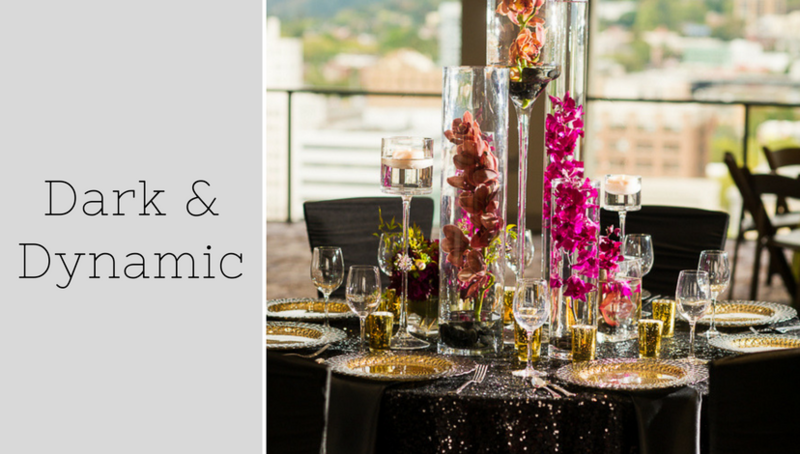 The elegant banquet setting is as dramatic as modern art, with greenery adding just the right amount of punch! 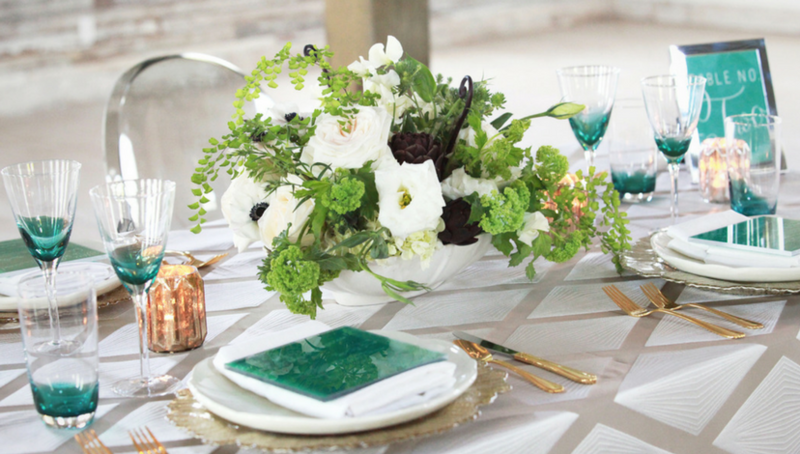 Note that the greens of the floral centerpieces complement, rather than match, the menu cards and glassware. The setting is surprisingly calm, even with patterned walls, trendy clear acrylic seating, and graphic patterned tablecloths. Deft use of a single color is what makes this scheme spectacular. 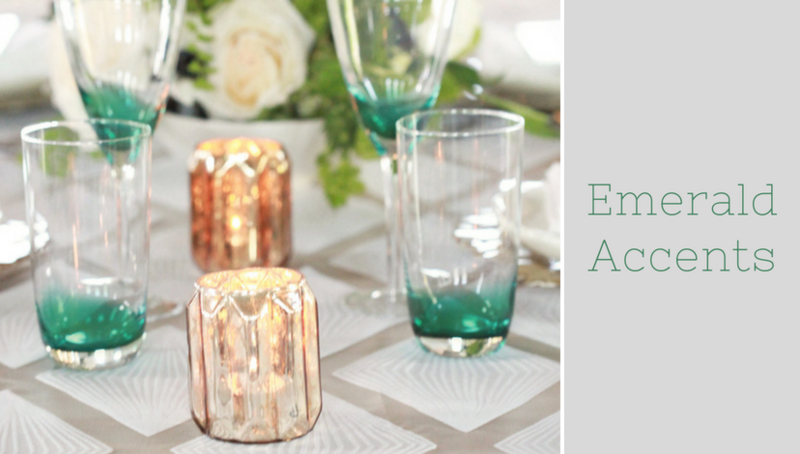 The slightest hint of watery green in the glassware is an inspired touch! 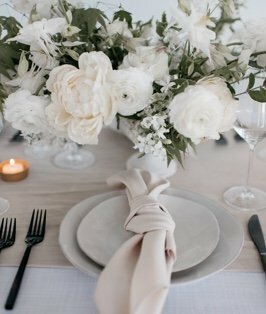 Perfection is in the details: Graphic tablecloths add zing, but don’t shout for attention, and predominantly white place settings and centerpieces accentuate the elegant decor. 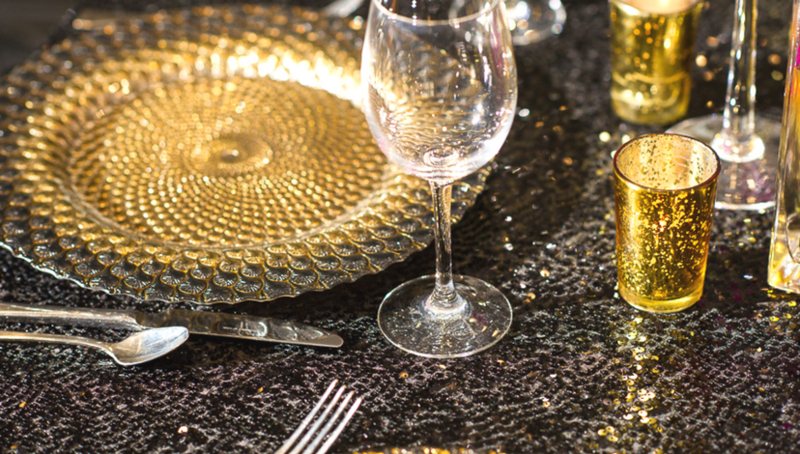 It all glows with a silvery presence, but guests certainly won’t feel chilly at this New Years Party! 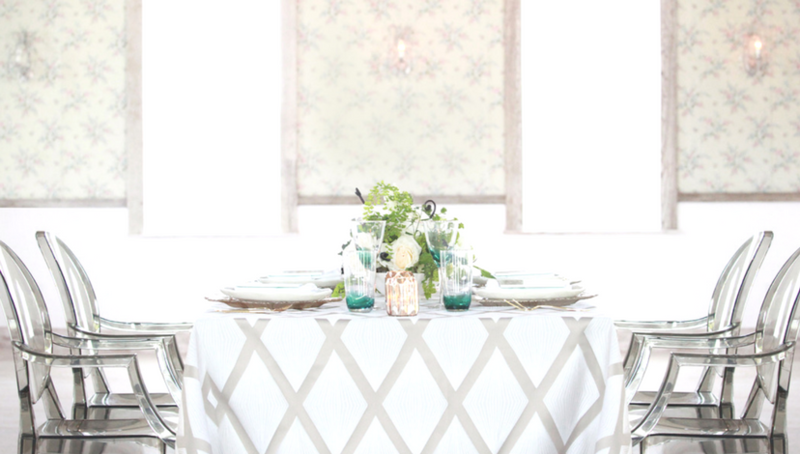 A subtle but ornate wallpaper pattern is echoed in textured table drapes and chargers. Gold touches keep the setting from feeling icy, helping to bounce the light from chandeliers and candles around the room. There’s a sense of the unknown about this gorgeous tablescape, highlighted by a dark and dramatic cloth that looks like a hidden pool in the moonlight. 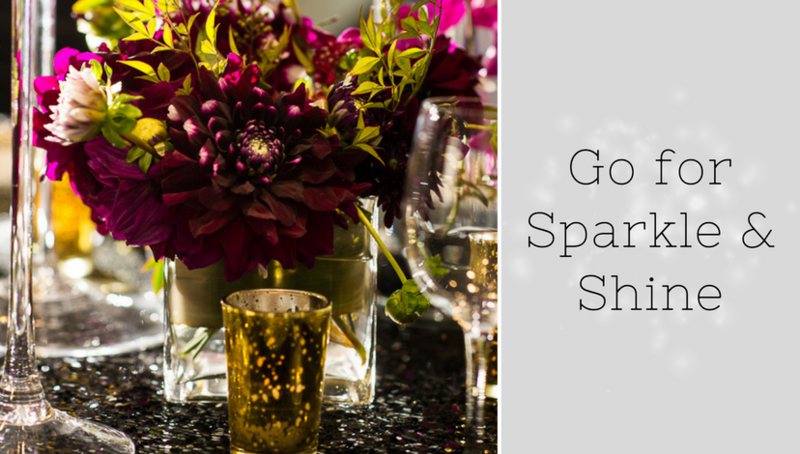 You’ll want to keep the lights low at this party, so that the sparkle and mystery can resonate fully to create a festive spirit! The appeal of this dining table is that it’s so unexpected and so perfectly executed. 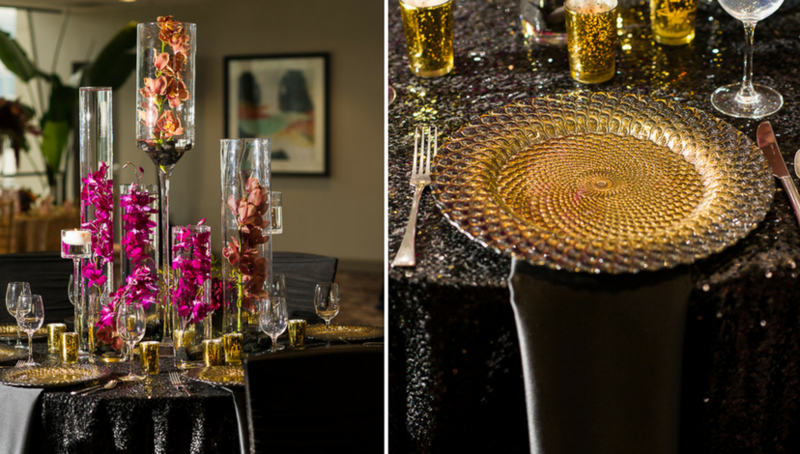 Layer upon layer of glitter and shine, as well as dramatic floral centerpieces, prove that “too much” is really never too much when it comes to great celebration settings. Success with this kind of elegance depends on your ability to pull together bold patterns, colors and textures. Textured gold and glittering black become the background melody in this holiday song, while clear vases allow colorful tropical blooms to hit the high notes! This rich setting may be as ebullient and audacious as Auntie Mame, but it’s sure to be memorable! What a splendid way to usher in 2017!